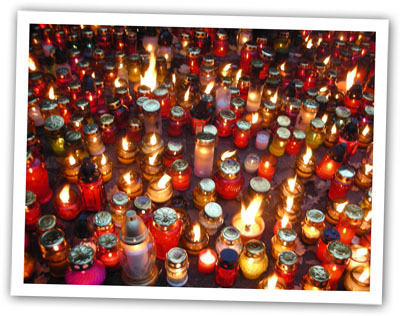 Before Moving to New York, Jon and I lived in Warsaw, where Halloween wasn’t such a big deal, but All Souls, the day after Halloween, really, really was. So this year I’m making potato rosti which take me back to Poland in one bite, and the sour cream and mournful black caviar seem in keeping with the mood of the day. Rosti usually involve both grating and frying – both of which can seem like a step too far on a Monday, I know. And honestly, boiled new potatoes cut in half lengthwise and smothered with sour cream and caviar are a delicious alternative. But I’m looking for crunch, so I persevere. I bake my rosti in a thin layer in the bottom of muffin tins. This has the added bonus of creating lots of rosti at the same time that are all the same shape – perfect for a party canapé. 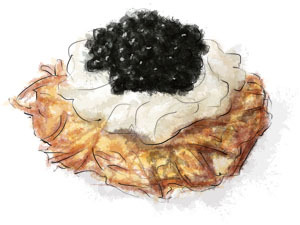 This entry was posted in The Monday Treat and tagged All Souls, caviar, potato, recipe, rosti, sour cream. Bookmark the permalink. Using a muffin tin is genius. Less oil, less work shaping and tending them as they cook. Love it!